Thousands of birds fall from the sky. 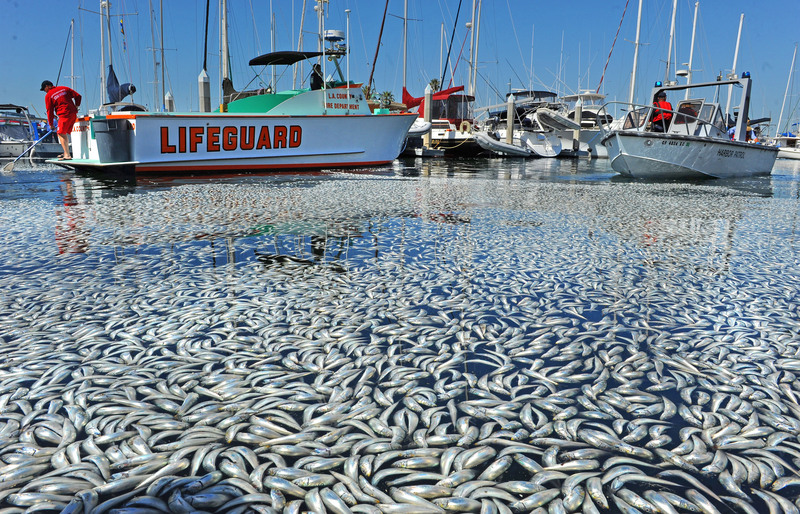 Millions of fish wash up on the shore. Honey bee populations decimated. Bats overtaken by a deadly fungus. Piglets die in droves from a mysterious disease. It was tragic stories such as these that prompted a group of researchers from the University of San Diego, UC Berkeley and Yale to embark on a broad review of all the reports of large animal die-offs in the scientific literature since the middle of the last century. They turned up 727 such papers documenting "mass mortality events" (MME) of 2,407 global populations of mammals, birds, fish, reptiles, amphibians and marine invertebrates -- like the thousands of starfish that perished in North America in 2014. Their analyses, published this week in the Proceedings of the National Academy of Sciences, revealed that not only are these events becoming more frequent, they're also increasing in magnitude, with the number of fatalities higher for birds, fish and marine invertebrates. Thirty-five events completely or nearly wiped out an entire population. Over the last 70-plus years -- between 1940 and 2012, when the researchers ended their data collection -- there has been about one more MME per year. "Going from one event to 70 each year is a substantial increase, especially given the increased magnitudes of MMEs for some of these organisms," said Adam Siepielski, University of San Diego assistant professor of biology and the study's co-lead author. The cumulative death toll reaches into the billions. The number one cause was disease, which was responsible for 26 percent of the mass killings, followed -- no big surprise -- by human activity, mostly traceable to environmental contamination. Toxic algal blooms, like the one that has plagued Lake Erie in recent years, have also emerged as a leading killer. "Mass die-offs result from both natural and human-driven causes," said study coauthor Samuel Fey, a Yale researcher who studies how extreme temperatures can affect biological populations. Honeybee crisis: What's killing the bees? And even accounting for the possibility of reporting bias -- that is, an increase of attention that can potentially skew numbers to look artificially more impressive -- he and the team believe that their results are robust. That said, as much as anything, their findings show how important it is to get the reporting right. "Determining whether or not the upswing in the occurrence of MMEs is a real phenomenon or simply a result of increased awareness remains a critical challenge that needs to be addressed," they wrote. "Such results, combined with lack of studies measuring MMEs using population-level data, highlights the need for an improved program for monitoring MMEs." Kent Redford, a conservation consultant and former director of the Wildlife Conservation Society Institute who was not involved in the study, agreed. "Rare and dramatic events capture the human attention and imagination," he told CBS News. "This paper makes the important case for the need to document the dramatic death of large numbers of animals. Understanding the factors that structure animal communities requires knowledge of how and why animals die and more importantly, understanding how and why human actions shape the 'unnatural' deaths of animals is a prerequisite to knowing how to ameliorate such deaths." But while headline-grabbing stories -- like the deaths of a third of the nation's honey bees due to colony collapse disorder, or white-nose syndrome, which has killed 6 million bats in the U.S. since 2007 (neither was included in the PNAS paper) -- deserve close study and widespread alarm, they don't show the whole picture. "We must not let the rare dramatic events distract us from focusing on the smaller but constant erosion of animal communities that is taking place worldwide as a result of human action," said Redford. "Over the long term, these less-interesting and less note-worthy mortality factors are undoubtedly more important to study and to stop."